“On Top of Spaghetti”: Kids love it, but why don’t they sing more songs about meat? Why don’t children sing more songs about meat? The late folk singer Tom Glazer first performed his classic children’s ballad “On Top of Spaghetti” in 1963. Sung to the tune of the traditional “On Top of Old Smoky,” the song tells the story of a meatball on the run. Swept from table to floor by a thunderous sneeze, the meatball ends up rolling outdoors. It bounces along, gathering dust, dirt, gravel, and bits of trash along its surface. Finally, it tumbles under a shrub, nothing but mush, a shadow of its once-plump self. The following summer, so the song goes, having presumably sunk well into the fertile earth beneath its leafy shroud, the battered wad of meat sprouts up as a moss-covered tree bearing saucy meatball fruit. I used to teach pre-kindergarten. Toward the end of my tenure, I played “On Top of Spaghetti” for my class of 4- and 5-year olds. The kids knew the song and were singing the first lines before the CD began spinning. When Tom and his gang of under-age back-up vocalists finished up, I posed a few questions to the gathered circle: Did the song make them hungry? Did they like meatballs? Did they like the idea of eating meatballs after hearing the tune describe, in graphic detail, one sorry meatball’s unsanitary backyard odyssey? The rest of the class agreed with Riley’s cast-iron logic. Meatballs, as Anna put it, were “a big treat,” regardless of what they’d rolled through. Piping up from under cropped dark bangs and a plastic tiara, Chelsea alone dissented. Thank you, Chelsea, I thought. Hearing someone take a principled stand for good hygiene brightened my spirits. Next, I asked: If you could bury anything tasty in the ground and have that something grow into a tree proliferating deliciousness year-round, what would you plant? “A chocolate yummy!” I recall Jason proclaiming. “A taco,” said Luke with a Spicoli-esque yawn. “I want a milky tree with candy and ice cream,” said Reese. “A French-fry tree!” barked Jackson. With the possible exception of Luke’s taco, meat was not mentioned. The class overwhelmingly wanted to plant sweet things: Ice cream, jelly beans, cake, muffins, and various fruits naturally found on trees in the first place. I knew that kids liked sweets, but the fantasies they shared—the orchards dusted with powdered sugar, the branches weighed down with icing—suggested a deep-seated love of glucose that couldn’t be attributed to bad parenting and corn subsidies alone. “The Fast Food Song” isn’t about eating meat exactly, but its simple chanted lyrics and associated motions (hands swooping in pie-like circles and “golden” arching arms) celebrate (and may well perpetuate) the ubiquity of fast food corporations responsible for dumping inexpensive and unhealthy meat products into the diets of children all over the world. 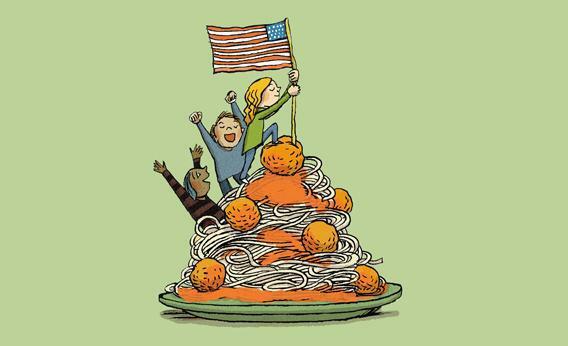 “On Top of Spaghetti” may not whet the appetites of adult carnivores, but it does give kids a silly, savory fantasy to kick around. The song appeals to kids because it’s about an inanimate object that comes to life. A meatball defies expectations, and defiance—within reason—is usually celebrated in children’s literature. Its message also reinforces the blithe way kids relate to meat. The song is no budding butcher’s anthem. Most of the preschoolers I’ve met haven’t grown up helping their parents cook, much less slaughter chickens. For all they know, meat, like money, may indeed grow on trees. The animal flesh they consume bears little resemblance to what butchers carve out of real animals that pump blood. Kids’ lunch-boxes are stocked with uniform salami discs, thin folded slices of slick deli turkey, corn dogs, and ground beef bits sneakily stirred into pasta sauces. Such foods are conceived, shaped, cooked, processed, and packaged to resemble something other than what they are. At some preschools, classes even go by animal names—like Lambs, and Cows— creatures the kids have cheerfully consumed in one form or another. Teachers and parents don’t talk about that, though, and the kids don’t make the connection. Reese, for example, knew her meatballs came from Trader Joe’s, and probably that they were made with turkey, but she didn’t get that the turkeys whose life spans her eating habits shortened looked like the ones in the class book about birds, that before they were whacked and plucked, they also resembled cartoon characters she had encountered and the crooked construction-paper effigies she had crafted. At naptime, three hours after the class listened to “On Top of Spaghetti,” Jackson lay on his mat, eyes fluttering open and shut, murmuring the words to the song before he drifted off. A day later, during a fire drill, a spirited quintet bellowed an impromptu rendition as the class lined up along a fence outside the school. Two days after that, the class enjoyed a potluck for parents and siblings that featured two kinds of hummus, banana pudding with ‘Nilla wafers, orange Jell-O, chocolate chip cookies, grapes, cantaloupe balls, cheese squares, assorted crackers, chicken wings (which only two girls and a few parents touched), and a tray of slightly more popular roast beef sandwiches. They all sang the song when their parents arrived, and once more, quite raucously, as they ate. I wondered: Could this song make them ask for meatballs at home? Maybe, a few years later, might they want to roll their own? And might they eventually even want to stuff the grinder themselves, starting with meat whose bones and skin make its provenance unmistakable? Perhaps, but no song will encourage them to make the connection between meat and animal. What makes kids really start to wonder, in seriousness, where their food comes from? You can take them a field trip to a farm stand. You can let them taste a superlative tomato, sweet and acidic. And you can describe how dirt and sunshine and the care of the farmer came together to make the tomato slices that are now sliding down their throats. But you can’t steer a school bus to even the most humane of turkey ranches and invite kids to take in the slaughter. But that’s because of our hang-ups, not theirs. Parents try to shield their kids from violence—and this includes not only gory movies but also the very real, very systematic process by which edible muscles and fat are extracted from the bodies of animals. Adults buy the meat that after processing and preparation looks as innocuous as a carrot stick. Adults write the songs that duck the question, trafficking in silly fantasy when the reality is too horrifying for a child to contemplate. Adults are complicit in the lie, prolonging it—like tales of Santa Claus and the Tooth Fairy—as long as possible. And then, when the illusion is inevitably shattered by a book or a chatty classmate, parents cling to it. “Don’t be disgusting at the table!” adults surely still bellow after a child, defiant yet unsteady, crosses her arms, nudges away her plate of sauce-smothered meatballs, and stammers for the first time: “I know where this comes from.